The apartment was extra spacious. The view was spectacular. It was fun watching the boats go by from the balcony. The WiFi signal was strong. The host was a lovely women. She made recommendations for hiking and other activities and also helped us out when we had an issue with the ferry booking. She went above and beyond. Thanks Christine. What a fantastic place to stay. The hosts were so friendly and helpful, going out of their way to accommodate our needs. They even picked us up and dropped us back to the ferry after our stay!! The apartment is in the perfect location, close to everything including a supermarket and beach bar/swimming spot. The apartment was newly refurbished and so clean and comfortable. One of the best places we have EVER stayed. We had so much room and comfortable furniture, the air conditioning was so good. The view and closeness to the water was exceptional. 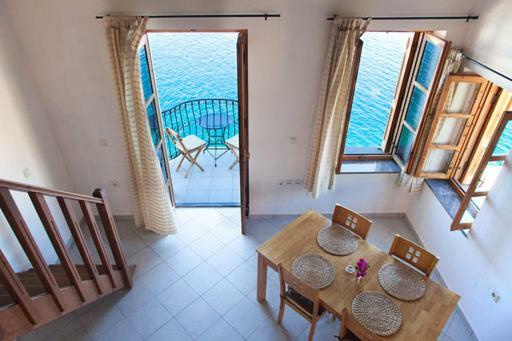 The apartment is right on the water front with a small balcony overlooking the sea. 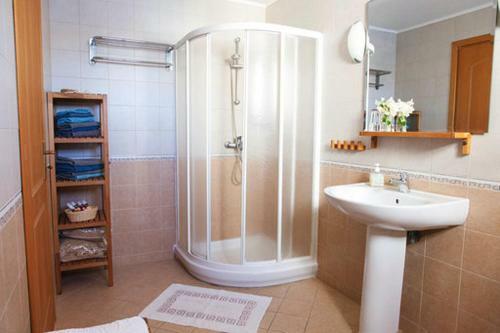 It is a 10 minute walk to the centre of town. It was spacious with good WiFi and aircon. Christina met us of the ferry in the morning and took our luggage. We explored the town, ate lunch and then checked in, in the afternoon. Christina dropped of our luggage at the ferry at 5:00pm on the day of our departure. What was not to like??!! Everything was absolutely wonderful - from the hosts themselves (Stavros and Christine), to the immaculate accommodation with everything provided. There were basic welcoming provisions in the fridge and every appliance (including a washing machine). The Villa has wonderful views towards the Symi harbour, and actually overlooks the sea - you couldn't be any closer to the water! Great location with excellent sea views across the harbour. The hosts were extremely helpful. The villa was a treat. We had so much space and an amazing balcony with gorgeous views over the sea. The hosts were lovely and went out of their way to make us comfortable. 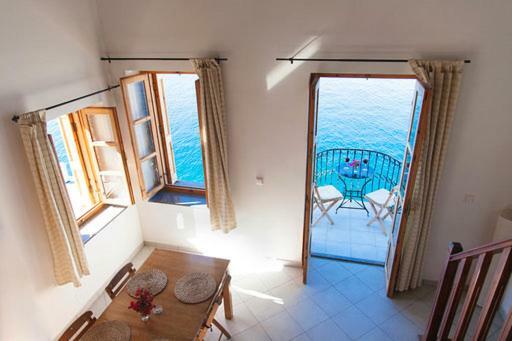 Lock in a great price for Villa - Eleni Apartments – rated 9.8 by recent guests! 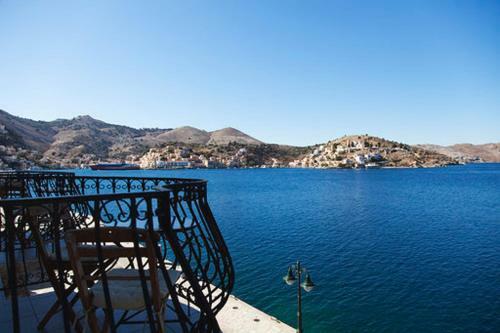 Enjoying a unique location right by the sea in Symi, the neoclassical Villa Eleni features panoramic views of the harbor. The beach is just 600 feet away. Free WiFi is provided. Shuttle service from the port to the villa is provided. A range of activities are offered in the area, such as snorkeling and hiking. 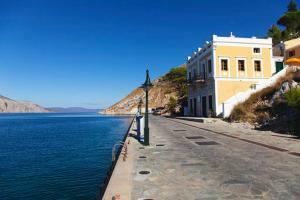 At 656 feet, guests will find a supermarket, a taverna and a bus stop. The center of Gialos and the taxi boats can be reached within a 10-minute walk. When would you like to stay at Villa - Eleni Apartments? This villa features an amazing view with exclusive equipment and and lot of space. 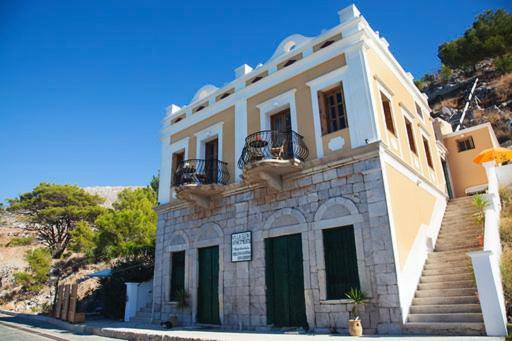 Die Villa wurde im denkmalgeschütztem, traditionellem Stil Symi´s von Stafro´s Familie ungefähr vor 110 Jahren erbaut und ist seither im Familienbesitz. 1975 wurde es durch Bauarbeiten oberhalb des Hauses stark beschädigt Ab 1998 wurde sie dann von Stafros mit viel Eigenleistung über Jahre wieder neu aufgebaut und ist jetzt in einem sehr gepflegtem Zustand. Die 2 Ferienwohnungen begeistern ihre Gäste durch ihr Flair und den wunderschönen ,weiten Blick auf den Hafen Gialos und die bezaubernden Sonnenuntergänge auf den Balkonen, von denen aus man die Fische im Meer beobachten kann. Das Zentrum ist zu Fuss in ung. 10 Minuten zu erreichen ( 700m) Ein Supermarkt, ein modernes Strand-Cafe mit Restaurant , die Bushaltestelle und Parkmöglichkeiten für Ihr eventuell gemietetes Auto , oder Moped sind 180 m Entfernung Durch seine Entfernung zum Nachtleben im Zentrum sind die Abende hier in der Regel angenehm ruhig . Das Haus befindet sich am Verbindungsweg zum neuen Hafen,deram 8.5.2018 eingeweiht wurde,.Vor dem Haus gibt es eine Leiter zum Meer. Stafros ist Symianer und hat als Schreiner gearbeitet. Seine Frau Christine ist Deutsche und Schweizerin und ist Hebamme . 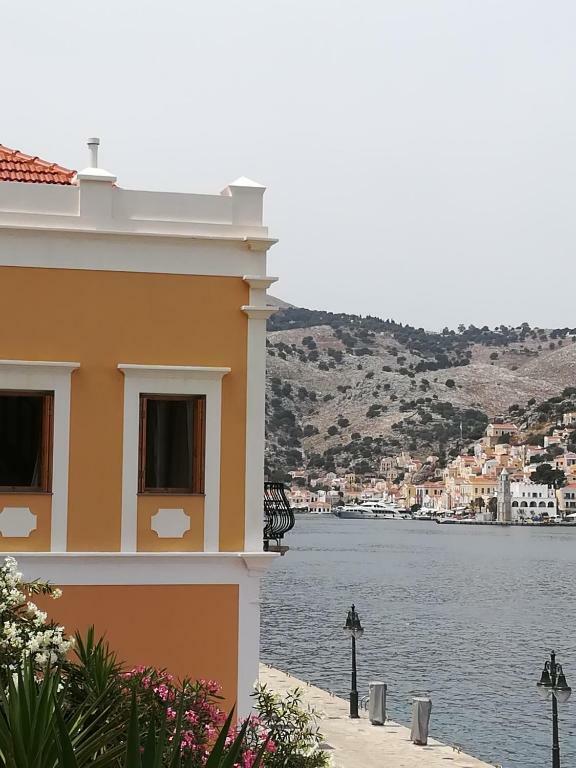 Symi begeistert durch seine Architektur. Die Ankunft im Hafen begeistert immerwieder aus Neue. 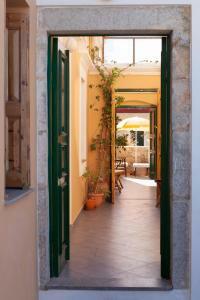 House Rules Villa - Eleni Apartments takes special requests – add in the next step! Please inform Villa - Eleni Apartments of your expected arrival time in advance. You can use the Special Requests box when booking, or contact the property directly using the contact details in your confirmation. Please note that check-in and key collection take place at: am Hafen , beim Abholen, Symi 85600. The apartment was right on the water about a 12 minute walk from the centre of town. This seemed like a bit of a trek at times. On the other hand it was away from the noise of the town and was very quiet. It could not have been more perfect. The only bad thing was leaving. The villa has very limieted trafic outside. Only traffic for big ferries 3-5 times/week. Possibilities to dive and swim right outside the villa. The host Christine is very helpful and she even ensures that "small things" like new dish dish washing sponge and other things are on place. Very recomendable. From the start, Christine and Stavos were Great Hosts!!! Christine was waiting for us at the port, greeted us and took us to the villa where Stavos welcomed us and helped take up our bags. They showed us around the villa and its amenities. It was perfect and has an incredible view of the harbour and is waterfront. It is at the left side as you first enter the harbour. My wife, son and I were all extremely pleased with the villa, the tranquil location and the wonderful hospitality of our great hosts. They loaned us some snorkelling equipment, water shoes and beach towels for our trips to the beaches. The villa was very clean, comfortable and well appointed. 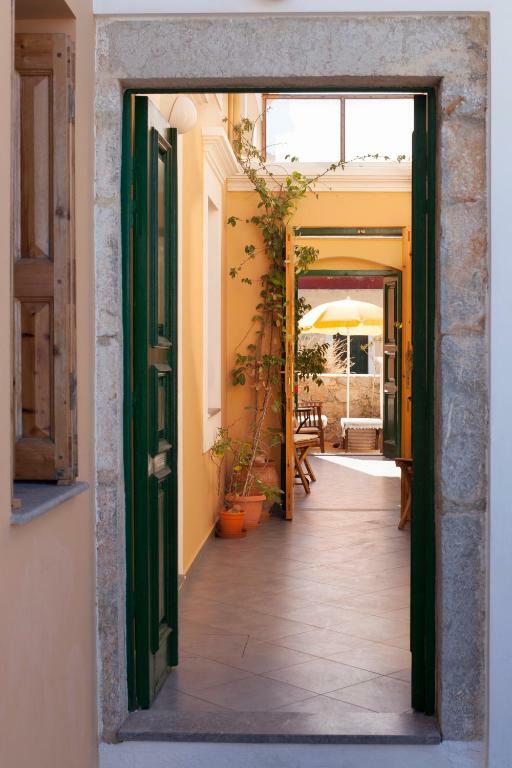 If you are looking for a relaxing and beautiful place to stay, I recommend staying at Christine and Stavos Villa - Eleni Apartments. It is a 5-10 min walk (mostly level grade) into the main harbour stores and restaurants. It is just far enough to allow for less noise at the villa, with the exception of the very infrequent Ferry arrival. Ask to see the before picture of the Villas and you will be very impressed with all the beautiful craftsmanship and love that Stavos and Christine put into them.